I've given up on straight up table salt after reading about all the scary chemicals and additives they put into good ol' Morton and similar brands to prevent the salt from clumping and to keep it nice and white...I'm sure there are plenty of other reasons for this. In fact, most traditional table salts have zero nutritional value. Yuck! That's why I only use natural sea salt, or my family's personal favorite, Himalayan salt, a pink coarse grain renowned for its health properties. It's naturally mined and is chock-full minerals like magnesium. In fact, the only way to make it better is to add your own flavorings to it to create a nice finishing salt for your meals. 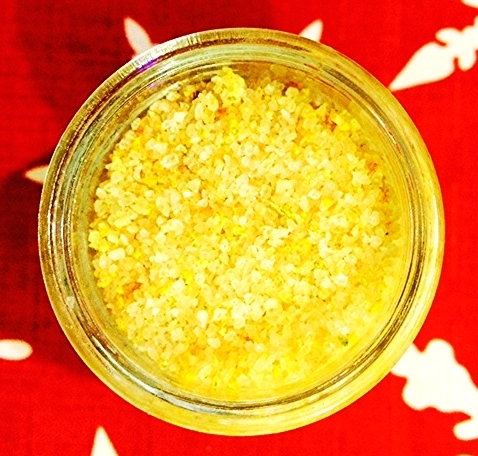 I like to use a combination of organic citrus zest to pop out the taste of the salt. This blend works well on salads, fish, and other light dishes that need a little burst of bright flavor. This pink of the salt adds a fun dose of color that compliments the zest nicely. Combine all ingredients until mixed thoroughly. Heat oven to 200 degrees. Spread salt and zest on a pan lined with parchment paper. Bake until zest dries completely, around one hour. Makes 1 cup. Store in a small mason jar and use within three months. Enjoy!